OK. The next mantra we’re going to learn is on the other card. This is known as the maha-mantra. The word “maha” means great. And “mantra” means mind deliverer. And mantra actually has the power to deliver our minds from the material realm to the spiritual realm. And of all mantras this is the greatest one. This is the mantra that Lord Gauranga prescribed specifically for the Kali yuga. This is the manta He Himself used and taught others. Looking at the mantra, we see it’s made up of three words: HARE, KRISHNA and RAMA. HARE is addressing the devotional energy of God. 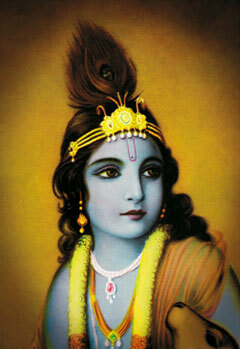 KRISHNA is one of God’s many names which means the All-attractive person. And RAMA is another one of God’s names which means He who gives transcendental pleasure to those who lovingly serve Him. The concept of God is often misunderstood. The word God indicates a position, a post or a title. Just like the word “king” indicates a position, a post or a title. A person who occupies the position of king is known as the king and is accepted as the number one person in the kingdom. In the same way the Supreme Person occupies the position of God. He is known as God and He’s accepted as the Number One person of all. However He has many, many names. And the problem arises when we take one of God’s names, separate it from the rest, we build a “religion” around it and then declare, “This is the only true God!” For instance, one of God’s names is Jehovah, and there are people who would have us believe Jehovah is the only true God. But we understand it differently. This is one of God’s many names which means the All-powerful. And, of course, Krishna is one of God’s names. And people say, “Well, that’s the Hindu God.” So now we got a Hindu God, we got a Jehovah God. This is sectarianism. And the great saint Bhaktivinoda Thakur declared that sectarianism is the greatest obstacle on the spiritual path. We must transcend sectarianism. And mantra meditation is non-sectarian. Throughout the world we find many different spiritual practitioners. They live in different parts of the world, they study different scriptures, they have different philosophies. But there’s one thing they all have in common. They all use beads. For instance, the Orthodox use beads, Catholics use beads, the Hindus, the Buddhists, the Muslims, all use beads; there are Chinese groups that use beads, we, the Vaishnavas, use beads. And the reason we all use beads is because they help us control our senses. You see, the senses are active by nature. And the activity of our senses drives our consciousness externally. Our eyes see an object, our consciousness goes to that object. Our ears hear sound, our consciousness goes to that sound. Our nose smells a fragrance, our consciousness goes there. Our tongue takes us all over the place. And the sense of touch always connects us with the outside: this is hot, this is cold. For a person who’s trying to go within in his silent meditation, this is a big problem. He’s trying to go within, but his senses are taking him without. So his solution is: stop the senses. So when he sits in his meditation, he closes his eyes, sometimes they use a table like this to rest their elbows on it. And they use these two fingers to close the eyes. They sometimes use the thumb to close the ears, locking out the sound. Middle finger: to close the nose, blocking fragrance. Keep the mouth shut, keep the hands to themselves. Like a turtle trying to draw all the senses inside. But it’s artificial because the senses are active by nature. So we have a different method. We allow our senses to be active. But we engage them in a spiritual activity. And the beads help us to do that.